Beautiful bright colors! I have it shown in a couple of colors I have done in the past. Some pictures are during the making of also. 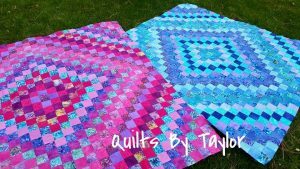 This quilt is shown on my love seat in outdoor light, and on the bed with indoor light, either way a beautiful array of saturated colors! Done with all 100% cotton fabrics, batting is Warm and Natural 100% cotton. 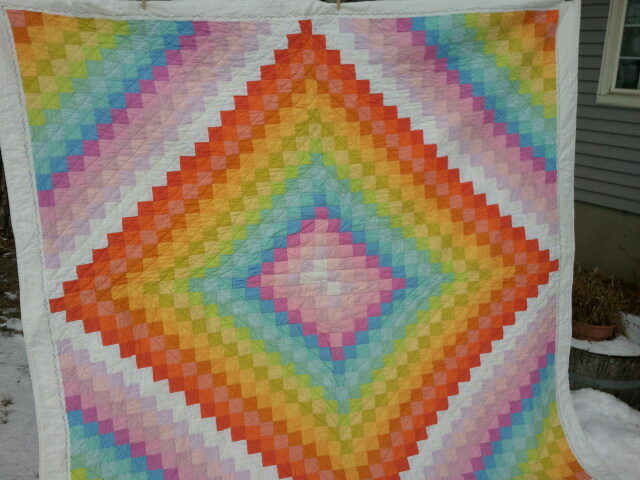 I have machine pieced, and machine quilted this beauty . The stipple stitching gives it that great antique texture that all your favorite quilts do. I pride myself in quality and attention to details. You wont be disappointed! Quilted Free Motion, All cotton fabrics, machine Washed and Dried, so easy care and no additional shrinkage. The jewel tone Baticks, mixed with my own Hand dyed is a rich bold color statement. Can be custom Quilted, and Choose your colors.